What impact do volunteers have on nonprofits? Currently, output numbers are easy to find, but outcomes and impact can be more challenging. In a survey released by the US Bureau of Labor Statistics, 25%, or roughly 62 million Americans, engage in volunteering – that accounts for 7.8 billion hours, worth about $184 billion. That is a lot of time, money, and resources people give to support a cause they believe in, which is wonderful. But for nonprofits to go beyond output metrics, like hours volunteered, to outcome and impact measurement – well, that takes a data-driven approach. The first thing to consider is: What are your nonprofit’s goals? Are you seeking to meet mission-critical deadlines, to increase awareness of your cause, or to expand your programs to more communities? Like many of today’s citizen changemakers, Cloud for Good employees want to make an impact. For nonprofits, being able to strategically measure the impact of volunteers can help you better understand the value of your supporters and identify opportunities for engaging corporate employees and volunteers of any kind even better. What’s more, when you show how volunteers are making an impact, you can potentially even inspire them to become donors, too. Sadly, only 55% of organizations are assessing the impact of volunteers. But for one data-driven organization, turning to technology to better asses their volunteer output helped them bridge the gap between correlating their program outcomes and the impact their volunteers were making. One of Cloud for Good’s Clients, Reading Partners, mobilizes communities to provide students with the proven, individualized reading support they need to read at grade level by fourth grade. 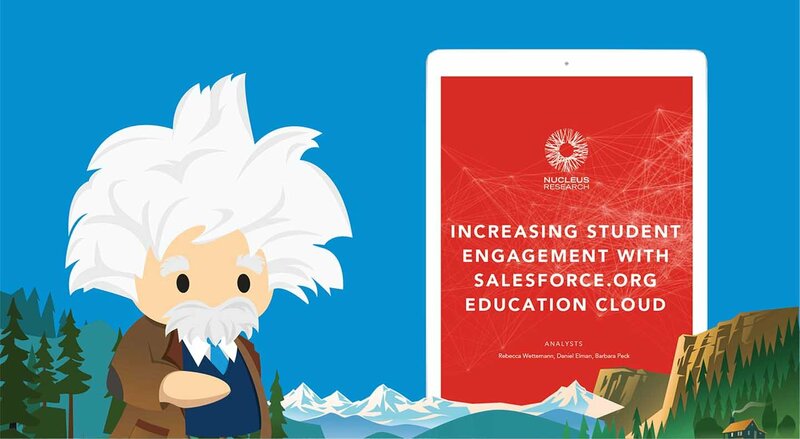 Reading Partners was using Salesforce.org Nonprofit Cloud to manage their volunteers, constituents, and programs, but they wanted to do more with the data they had. 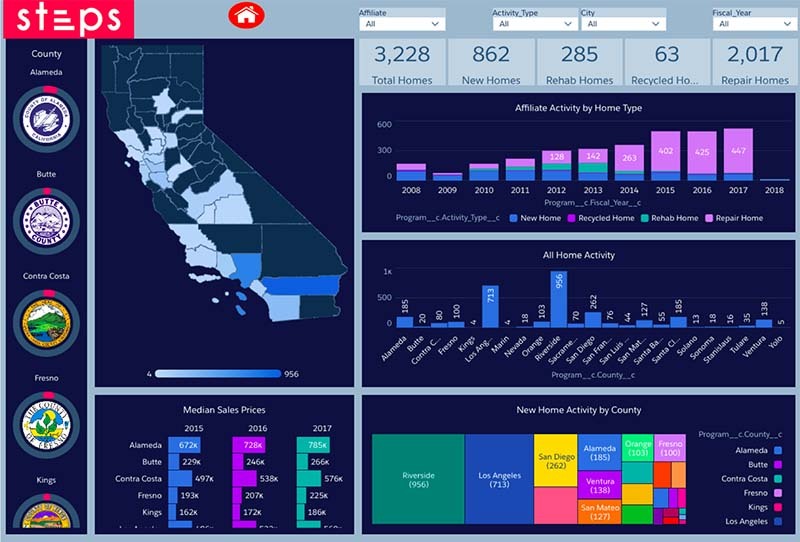 They decided to turn to Einstein Analytics, part of Nonprofit Cloud, to take their reports and dashboards and turn them into something more tangible. They can now drill into the data they store in multiple systems to identify opportunities to make more informed decisions based on their impact data. 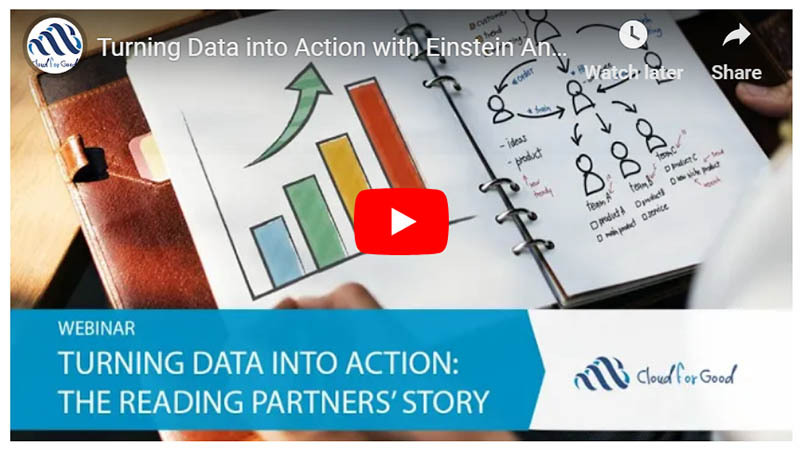 Find out how Reading Partners turned their data into action with Einstein Analytics. One of the first dashboards that Reading Partners created in Einstein Analytics was for their community engagement, specifically focused on their volunteer tutor recruitment and impact. This showed their program output metrics, such as progress toward their goals, what demographics they were engaging, how many tutoring sessions were being provided, and sourcing details to deliver insight into where their tutors are coming from. This dashboard replaced legacy spreadsheets, delivering a reporting foundation to help them better understand their data and answer questions that they didn’t know to ask when just utilizing standard Constituent Relationship Management (CRM) reports. Specifically, Reading Partners is now able to identify gaps in tutor recruitment and proactively drive action back into Salesforce through activity management such as Tasks and Chatter. This allowed Reading Partners to realign their recruitment focus with the locations that need it the most. They are also able to focus on the outcome and impact metrics that correlate their volunteer impact to their program success. With Einstein Analytics, they know if they recruit enough tutors or not, by location. With Einstein Analytics, Reading Partners can also utilize Chatter to share dashboards to a wide audience, making data easy to understand. The dashboards are easy to customize and can even be branded in company logo and colors. 1. Survey Volunteers to Gauge Satisfaction: The satisfaction of your volunteers can help you understand if you are utilizing them in the correct way. Do they feel overwhelmed? Are you making the most of their skills? An easy way to measure this satisfaction is through creating and analyzing volunteer satisfaction surveys. SurveyMonkey has a great template with some suggested questions to get you started. 2. Track New & Repeat Volunteers: Determine metrics like how volunteers find your organization and volunteer retention rates to help with your volunteer recruitment process. Track the number of repeat volunteers to help you evaluate the ROI of the volunteer experience: think of this as “volunteering moves management.” Getting a new volunteer on board has costs. Like employees, this can include training, recruitment, and retention costs. Each time your volunteers come back, this means you have fewer costs associated with training and onboarding them into your programs – and more money for your mission. 3. Measure Donations Made by Volunteers: According to Fidelity Charitable’s Time and Money: The Role of Volunteering in Philanthropy, 87 percent of volunteers say that there is an overlap between the organizations they support financially and those they support with their time. Keeping track of these relationships can help you measure the value of your volunteer program and increase the understanding of some of your key supporters. 4. Know Your Project Outputs: In order to move towards outcomes and impact, you can start with program outputs. This can include metrics such as the number of children who successfully learned how to read in your tutoring program, how many families were fed at your food bank, or how many pets were adopted at your shelter. Volunteers play a key role in maintaining the success of these programs, and measuring this number can help you better understand the impact your volunteers are having on your organization. Your community wants to know that their work, money, and time is making an impact. Armed with the right technology and metrics, you’ll have a complete story to share with your board of directors, funders, and volunteers. This story can help your organization make the case for more funds, increase volunteer recruitment and retention, and further your organization’s mission. Feeling flummoxed by how to measure your outcomes and impact? Once you’ve identified which success metrics are important to your organization, you can start quantifying the impact of your volunteers. Last year, Cloud for Good started the Cloud for Good Volunteer Week, a week where our workforce from all over the country gives back to the community as part of our participation in Pledge 1% and our Corporate Social Responsibility Program. 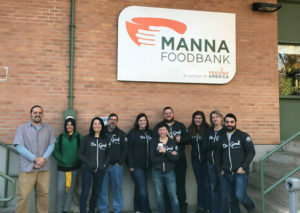 Our team volunteered at 17 food banks around the world, including the Los Angeles Regional Food Bank, Newmarket Food Bank Pantry in Ontario, Canada, and the Amsterdam Food Bank in the Netherlands. Employees helped in a variety of different tasks; ranging from packing food bags, sorting meat, and packing thousands of bags of pasta. The volunteer week helped us reach 1,000 volunteer hours, which are given as part of either group or individual projects. And, one year later many of our employees donated to the food banks they served along with close to 35% returning to volunteer again. For more on nonprofit impact measurement, this e-book from Salesforce.org is a good resource. 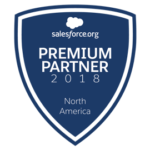 Cloud for Good is a Salesforce.org Premium Partner that helps nonprofit organizations succeed with Nonprofit Cloud and helps higher education institutions advance with Education Cloud. Tal Frankfurt (@TalFrankfurt) is Founder and CEO of Cloud for Good, a certified B Corporation and an Inc. 5000 company that works with organizations to create transformational value with Salesforce. While working as a spokesperson and director of resource development for a nonprofit organization, Tal was looking for tools to better manage his constituents (donors, volunteers, the media etc.). 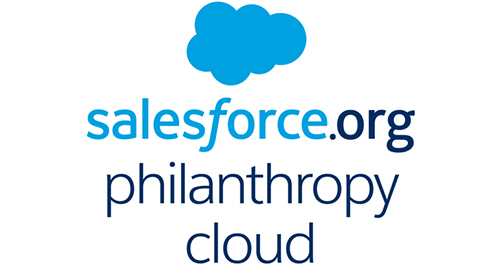 He heard about Salesforce.org Nonprofit Cloud and this started a snowball effect. The rest, as they say, is history. He founded and led one of the first Salesforce Nonprofit User Groups and was exposed to the growing need for many nonprofits to integrate technology tools such as Salesforce to achieve their mission. Subsequently, Tal founded Cloud for Good, a consulting firm that works primarily with nonprofit organizations and educational institutions. Tal was chosen in 2010 to be one of the first Salesforce MVP Program members and was inducted to the MVP program Hall of Fame in 2018.